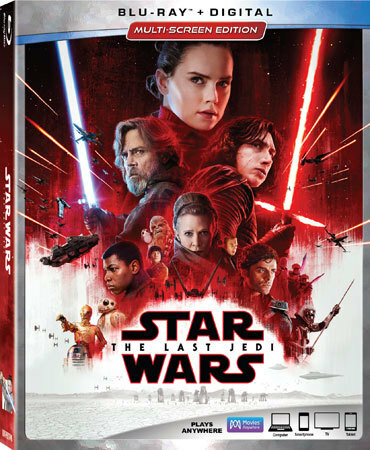 Is Star Wars The Last Jedi on Blu-ray worth a collect or gifting? Kidzworld watched all the many extras. Check out our Blu-ray review. In Star Wars: The Last Jedi, Luke Skywalker (Mark Hamill) refuses to train Rey (Daisy Ridley) in the ways of the Force. General Leia Organa (Carrie Fisher in her last performance) is leading what’s left of the Rebel forces against The First Order. When General Hux’s forces use a tracker to follow the last of the Rebel fleet even through hyperspace, it’s up to Rey, Finn (John Boyega), Poe Dameron (Oscar Isaac) and a feisty mechanic named Rose Tico (Kelly Marie Tran) to stop them. Meanwhile, Rey fights her connection to Kylo Ren (Adam Driver) who wants to replace Supreme Leader Snoke (Andy Serkis) at all costs. Leia is afraid all is lost Courtesy of Lucasfilm Ltd.
A First Order Fleet is attacked by Poe Dameron but many Rebel lives are lost. 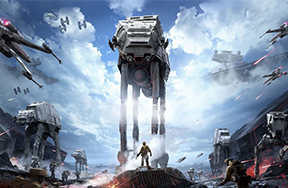 Resistance fighters led by General Leia Organa have to evacuate their main base. Resistance vessels jump into hyperspace to escape while Leia demotes Poe for disobeying orders and getting more pilots killed. The fleet’s fuel supplies are dwindling. During a battle, Kylo Ren has a chance to destroy the ship carrying his mother Leia but finds he can not. The ship is hit anyway and Leia, using the Force, is the only survivor but in a coma when rescued by Rebels. 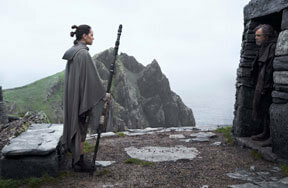 Poe disappoints Leia by being too gung-ho Courtesy of Lucasfilm Ltd.
On island Ahch-To, Rey, having arrived with Chewbacca and R2-D2 aboard the Millennium Falcon, finds that Luke won’t teach her the Jedi way despite her telling him that Leia and the Resistance really need him. He thinks it is time for the Jedi to disappear. We learn that Rey carries a device that will always let her track the Rebellion. Leia wears one as well. Learning Han is dead, and after reuniting with R2D2, Luke tries to teach Rey about the Force. She is so strong that she and Kylo Ren are able to communicate, even “see” each other at a distance. Kylo and Luke give different versions of the incident that drove Kylo to the dark side and Luke to isolation on the island. 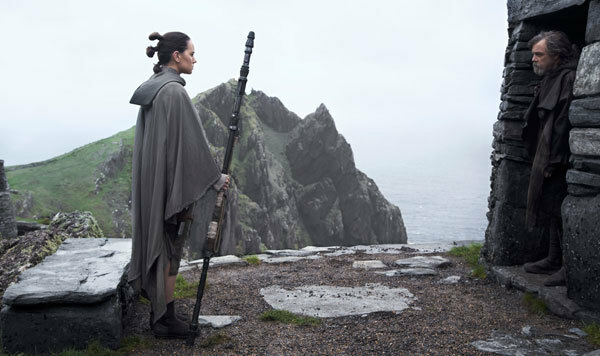 Rey challenges Luke Courtesy of Lucasfilm Ltd.
Rey is unable to convince Luke to re-join the rebellion and feels that Kylo Ren still has light and good in him so she leaves the island and allows herself to be captured so she can face Kylo. 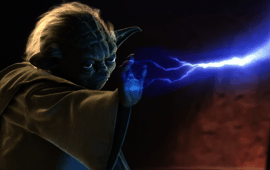 Yoda’s spirit comes to Luke to tell him that his failure can be the greatest teacher. Meanwhile, Rey is taken by Kylo to confront Snoke who practically tortures her to learn where Luke Skywalker is. Rey urges Kylo to rebel and turn to the light. Snoke explains that he controlled the mental connection between Kylo and her as part of a plan to destroy Luke. Ordered to kill Rey, Kylo instead kills Snoke. Rey and Kylo work together to kill Snoke's guards. Kylo asks Rey to help him build a new order, but Rey refuses and asks him to join the Resistance. 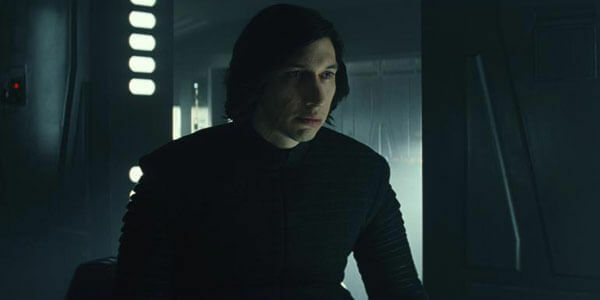 Kylo feels a connection to Rey Courtesy of Lucasfilm Ltd.
Snoke hopes Kylo is his own new hope Courtesy of Lucasfilm Ltd.
Vice Admiral Amilyn Holdo (Laura Dern) is in command since Leia is in a coma. Poe has found Leia’s tracker connected to Rey. He must to go Rey. Poe, Finn, mechanic Rose Tico and droid BB-8 embark on a secret mission to both find Rey and disable the First Order’s tracking device which emanates from their lead ship. First, they must break a code protecting it. They are off to a big casino planet on Canto Bight to get the most famous code decoder guy in the Galaxy to help them. After being captured and put in jail, they manage to escape with the aid of DJ (Benecio del Toro), a decoder. 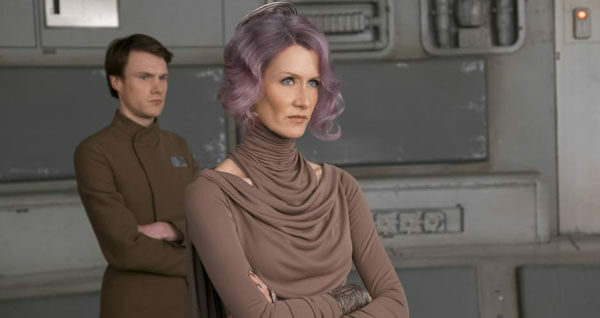 Vice Admiral Holdo tries to save the fleet Courtesy of Lucasfilm Ltd.
Holdo is pro-active and is slowly evacuating the remaining Resistance members to a nearby old Rebel Alliance stronghold using small transports and she has an additional plan. Will there be enough time? Poe and group infiltrate the lead First Order ship, hoping to disable the tracker but are captured by Captain Phasma (Gwendoline Christie). BB-8 manages to escape but traitor DJ reveals the Resistance's plan to the First Order, and the evacuation transports are targeted with heavy losses. 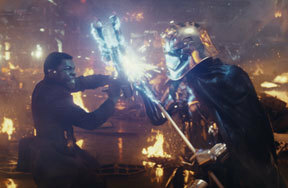 Phasma and Finn battle Courtesy of Lucasfilm Ltd.
Will Luke come to help the resistance? Will Leia recover? Will the Rebel fleet escape The First Order? Will Kylo stay on the Dark Side or join the Rebels? Will Poe, Finn, Rose and BB-8 escape to rejoin the fight? And has Rey escaped after her confrontation with Snoke and Kylo? Will the Resistance survive? Will more Rebels join the small numbers of resistance fighters left? Luke must decide if he can help the rebellion Courtesy of Lucasfilm Ltd. This Blu-ray set is loaded! All the extras are on a bonus disc but the first disc with the film contains an Audio Commentary with writer and director Rian Johnson. He talks a lot! His enthusiasm is infectious. Some of the info appears in other parts of the extras but worth a listen. The Director and the Jedi –This is a really looong making-of doc covering every aspect of production, pre and post as well. We have Rian Johnson directing actors at Pinewood Studios, Mark and Daisy running lines and more. We are told that Mark disagreed with Rian’s take on the Luke character but still helped him realize his vision and was eventually proud of the outcome. Sets, locations, costumes, creatures, weaponry, all SPFX, editing etc. are covered (everything, oddly, except music). Actors talk about their roles; Benecio del Toro, Lara Dern, etc. comment. We see Carrie Fisher on set and commenting on the film’s version of Leia and her scenes with Poe and Holdo. Very emotional extra and a nice Carrie tribute. We have Rian’s birthday and Mark Hamill’s last day on set coverage. A really complete extra and very well done! 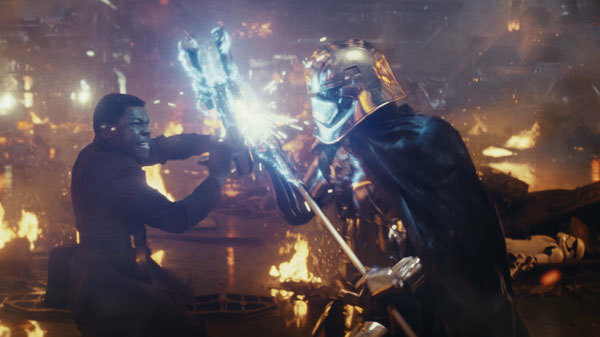 Scene Breakdowns – “Lighting the Spark: Creating the Space Battle”, “Snoke and Mirrors” and “Showdown on Crait” are the three scenes covered in great detail focusing on the people, not just the ships in battle. 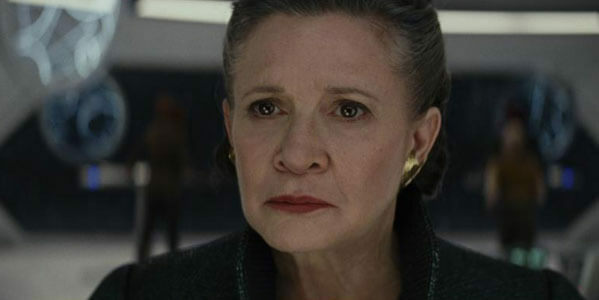 Carrie comments on Leia’s feeling of loss etc. Tons of behind the scenes footage. 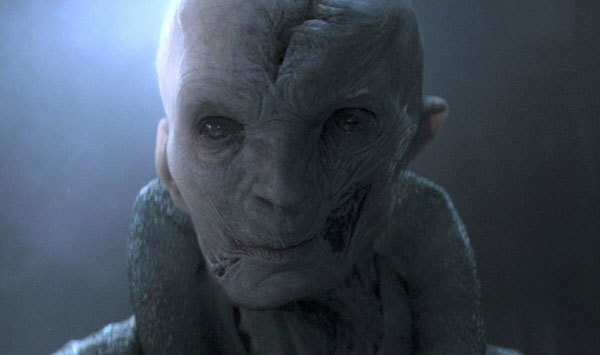 Andy Serkis talks about creating the Snoke character with mo-cap. And the final battle, new walkers, red earth, crystal foxes and especially Luke’s ending with peace and purpose are covered. Wonderful! 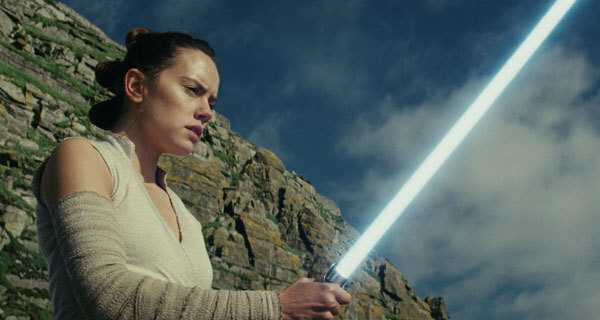 Rey must learn the ways of the Force Courtesy of Lucasfilm Ltd.
Balance of the Force - The director Rian Johnson gives his take on what the Force really is at this point for a new generation. Why is Luke really on the island? Daisy gives her take on Rey. The Rey and Kylo relationship is discussed as is the Luke and Kylo ending confrontation. Luke does become an inspiration for as his story spreads. This is an extremely interesting extra whether you agree with Johnson’s take or not! Loved it. Andy Serkis Live! - (One Night Only) This is Serkis’s complete performance in motion capture gear of the Snoke character. It is a real tribute to just how darn good this actor is! Deleted Scenes- 14 sequences with optional commentary and director introduction. I’d say watch both ways. Interesting to see why Johnson thought he had to remove some scenes. A few you wish were still in….so does he! This Blu-ray offering for your collection contains some really great extras. I can’t think of anything except the film’s soundtrack and music creation, that isn’t covered in beautiful detail. Some of the extras fill in blanks that might have been unclear or seemingly missing in the film. 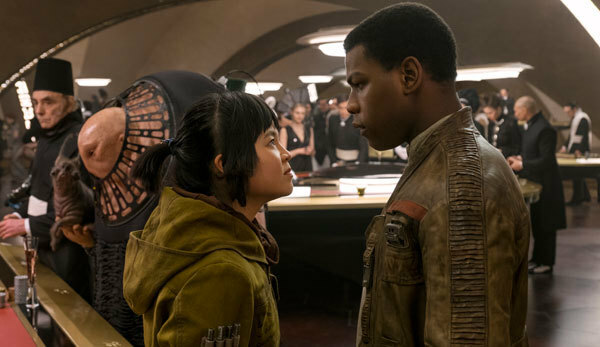 Rose and Finn make a plan Courtesy of Lucasfilm Ltd.
Star Wars: The Last Jedi is a triumph for new generations and original fans. The film is emotionally satisfying while keeping up its war-driven pace. There are secrets, twists and revelations galore. Special effects are breath-taking. I especially enjoyed several new “critters” ranging from tiny penguin-like beings to huge, lovable animals used as horses for racing and fox creatures who seem to be made out of crystal. 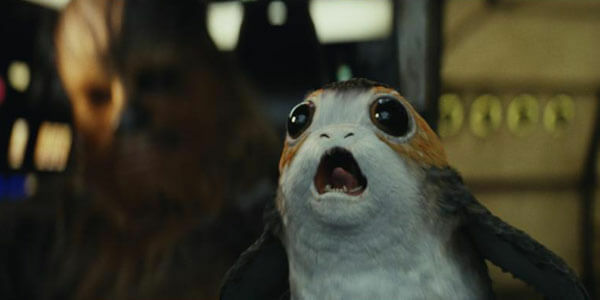 A tiny Porg Courtesy of Lucasfilm Ltd. The movie is a fitting tribute to Carrie Fisher. I finally cried during the scene in which Luke and Leia are briefly reunited. What is said could also apply to Mark and Carrie in real life. 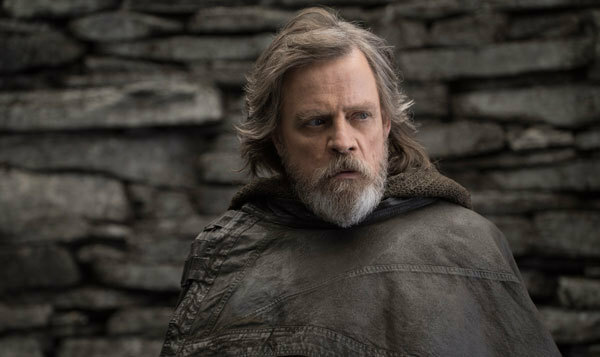 Mark Hamill gives the performance of his career embodying the courage, heroism and emotional exhaustion that completes the older Luke Skywalker. Just wonderful. The light saber has been successfully passed to a new generation. 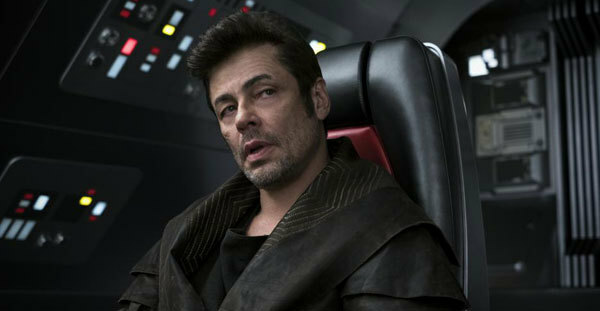 DJ (Benecio del Toro) is really out for himself Courtesy of Lucasfilm Ltd. This Blu-ray offering is a beautiful way to please any fan with some gifting and/or a great part of any Star Wars collection. As we did for the film, we go five stars. Star Wars: The Last Jedi Blu-ray Courtesy of Lucasfilm Ltd.
Can you barely wait to collect or gift this great home entertainment set? How did you feel about developments in the film. Talk all things Star Wars with a comment below!